San Diego startup, Bixpy LLC, has just announced the launch of the Bixpy Jet. A modular jet engine that attaches to all manner of floating things – just perfect for lazy watersports aficionados. The team put on their thinking caps and soon realised that there was a gap in the market for a lightweight engine to give a bit of extra oomph to all paddle sports, and that, dear reader, is the Bixpy Jet. “We’ve worked incredibly hard to bring Bixpy Jet to life and we’re excited to give watersports enthusiasts new ways to enjoy their favourite activity on the water, explore new places and find new adventures,” says Houman Nikmanesh, the Company’s founder and CEO. The Bixpy can be attached to anything that floats. In fact you don’t even need a vessel, at its simplest the Jet attaches to a super slimline battery pack and can be used to pull you through the water sans boat. The Bixpy Jet itself is titchy, about the size of a two litre Coke bottle, and it weighs in at just under 1kg. The Jet generates enough thrust to drive a kayak or SUP through the water at up to six knots. At full throttle it’ll run for about an hour but, if you slow down a bit, a battery will last between two and six hours. The Jet has been designed for easy battery swapping, so there’s no reason why you can’t stick a spare in the back of the kayak and double your fun. The range depends on the speed but Bixpy estimate a range up to 15 miles on a single charge. 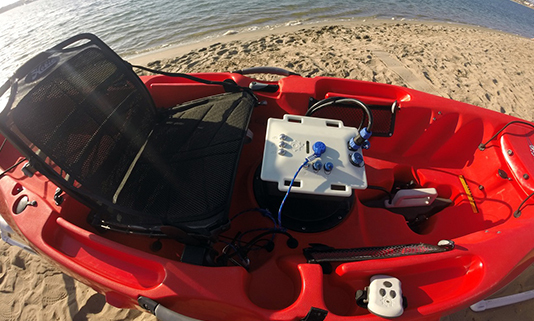 Both the Kayak Jet and the SUP Jet are powered by a 450 Wh lithium-ion battery pack, which includes a 1A outlet for phone charging and takes about four hours to reach full charge. 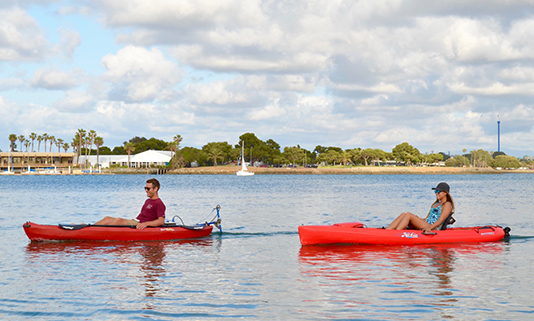 The Kayak Jet comes with a variety of fastenings, which means it can be attached to any kayak. You bung the waterproof battery pack in the back and zoom off, controlling the Jet with a wireless joystick that has ten forward and three reverse speeds. 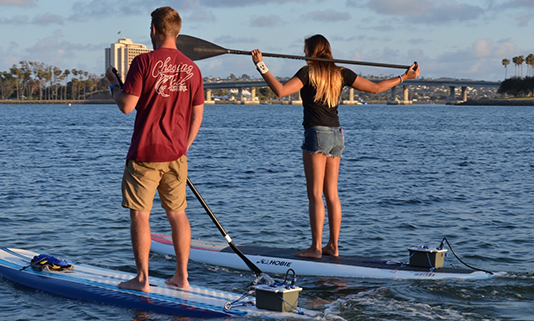 The SUP Jet looks a bit unwieldy; the large battery box sits atop the paddle board and is secured with bungie cords while the Jet itself replaces the SUPs middle fin underneath. But, hey, if it gives your arms a rest, who cares? A wireless wristband controls the SUP Jet. The 180Wh battery on the Swim Jet is rather more slimline and the whole combo has the look of a rather large cordless drill. Step into the water and at the press of the trigger you can be zooming around at depths of up to 27 m. It offers two speeds and includes a 900-lumen torch and a mount for a GoPro (other waterproof cameras are available). The smaller battery will run for up to two hours and charges in the same amount of time. The Bixpy Jet hasn’t been released for sale yet but you can pre-order on their website. A Kickstarter campaign is due to be launched sometime this summer. So if you’re feeling a bit lazy, or you just need a bit of a hand to get back against the tide, keep an eye out for the Bixpy launch, it may be the answer to your dreams.